cute idea! The Little Folks make up into sweet little bags. 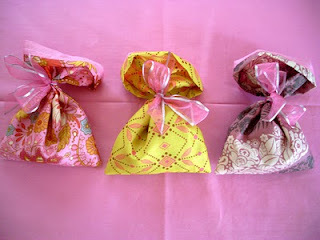 Gorgeous little bags, Andi and I like the idea of using voile. I have spent about an hour browsing through items on your Blog - past Posts and Comments and lot of other Sites, too - your Blog is just so interesting! My thoughts on the 'controversy' - if you can't say something nice don't say anything at all! What a perfect and meaningful gift at the same time, such pretty fabrics. Now I wonder why I don't have nice smellies in my drawer, might have to remedy that. Lovely gift bags. Love the voile, so soft and pretty. Your MIL will surely love them too. Good for you and Happy Birthday to your Nan ! So cute! I really need to get some of that toile. What a great use of that wonderful fabric! Sorry bout the hassle on the last post. I work in a fabric store, and teach at two. I buy a lot there and ALSO purchase online when it fits my budget. I guess I'd consider myself a collector, but that's only so I don't have to use the word addict. Only safer if Nan likes the whiff of roses! I only ay because my Nan has a big bone to pick with anything purporting to smell like gardenia. I found out the hard way.